Port Bair, is connected with Chennai, Kolkata, New Delhi and Bhubaneshwar by air. Air India, Jet Airways, Jetlite, Go Air & Spice Jet Airlines operate regular flights. Foreign chartered flights are also permitted to land at Port Blair subject to the fulfillment of guidelines of the Directorate General of Civil Aviation. 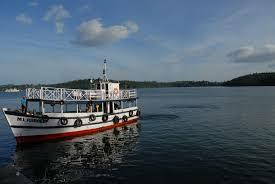 Regular passenger ship services are available to Port Blair from Chennai, Kolkata and Visakhapatnam and back. There are three to four sailings every month from Kolkata and Chennai to Port Blair and vice-versa. There is only one sailing for Visakhapatnam in a month. The voyage takes about 50 to 60 hours and the ship normally berths at Port Blair for about two to four days. 3 The Directorate of Shipping Service. Andaman and Nicobar Administration, Phoenix Bay Jetty, Port Blair. Explore the Island Paradise from the sky with the India's first Seaplane service. Flying in Seaplane in Andaman especially in Port Blair – Havelock-Port Blair sector has already caught the imagination of tourists including celebrities and general public. The Seaplane has large individual windows through which the fantastic aerial view of the island could be enjoyed In Port Blair, the Seaplane operates from the Helicopter terminal in the Airport, and in Havelock, Diglipur & Hutbay it lands on and takes off from the earmarked waterdrome near the jetty. Floating pontoon is placed in the waterdrome on which passengers are disembarked from the seaplane. To take passengers to shore from the Pontoon and vice-versa, speed boat is pressed into service. Just climb into the seaplane, get a window seat and take off to enjoy aerial view of India's only active volcano, Barren Island, or fly over the magical sea to relish Havelock, Diglipur and Little Andaman Island and savour the lush green landscape from high above. Tickets are available with important tour operators & travel agents in the islands. Seaplane is also available for charter basis Rs.1,10,000/- per hour. Seaplane services on following tourist circuits* can also be explored.